One thing that needs to be understood with phishing: It generally does not install anything on your computer. Phishing relies on you giving your info away. Hence, it doesn’t matter what operating system you use, you are at risk IF you give your information away. Apple can’t save you here folks. The above email has been pushed out, and if you use Dropbox, even just a little, you may fall for it. Remember, “hover” your mouse pointer over the button to see what is shows. 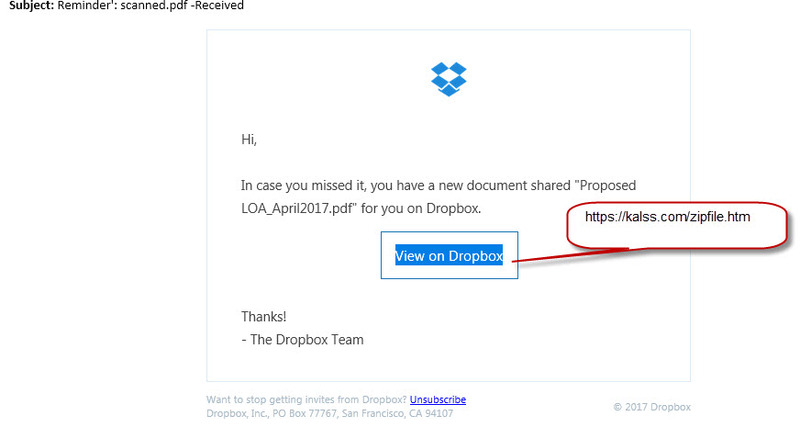 If it does not show a URL as you would expect, like www.dropbox.com in this case, then do NOT click on it, just delete. Using a sacrificial computer, we check risky email links and here is what we see. Even though the email was for Dropbox, as you can see, they must be sending out phishing emails for the various email provider: Outlook.com, Yahoo, AOL, GMAIL and Office365. Of note, Dropbox isn’t even on this page. Hover on any of these and again you’ll see the URL doesn’t match what it should be.